A sixth form pupil will spend the summer alongside leading academics at the University of Southampton working to redefine the kilogram. Chris Sumner, who is currently studying Maths, Further Maths, Chemistry and Physics at Oakland Sixth Form College, will redesign a Kibble Balance, made of Lego. A Kibble Balance, which was previously known as a Watt Balance, measures the weight of an object very precisely by the strength of an electrical current and a voltage. It is being used in the global effort to redefine the kilogram, which comes into force in May 2019. A working balance can measure a kilogram almost exactly but the Southampton one has experienced some challenges – Chris will be redesigning the balance and making small changes to improve its accuracy. The kilogram has been previously defined by the International Prototype Kilogram (IPK) - a cylinder of platinum-iridium, which was made by Johnson Matthey in 1889 and held under lock and key at the BIPM in France and is what all other kilograms are measured against. However, materials can gain and lose atoms due to chemical interactions with the atmosphere. 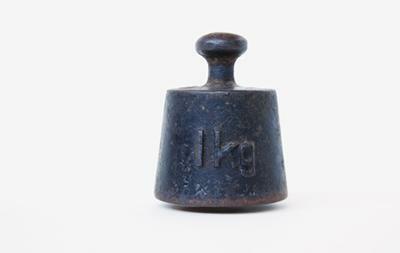 This would not be noticeable to the naked eye but to the scientific community, those fluctuations make a big difference, which is why the kilogram is being redefined using the Kibble/Watt balance.